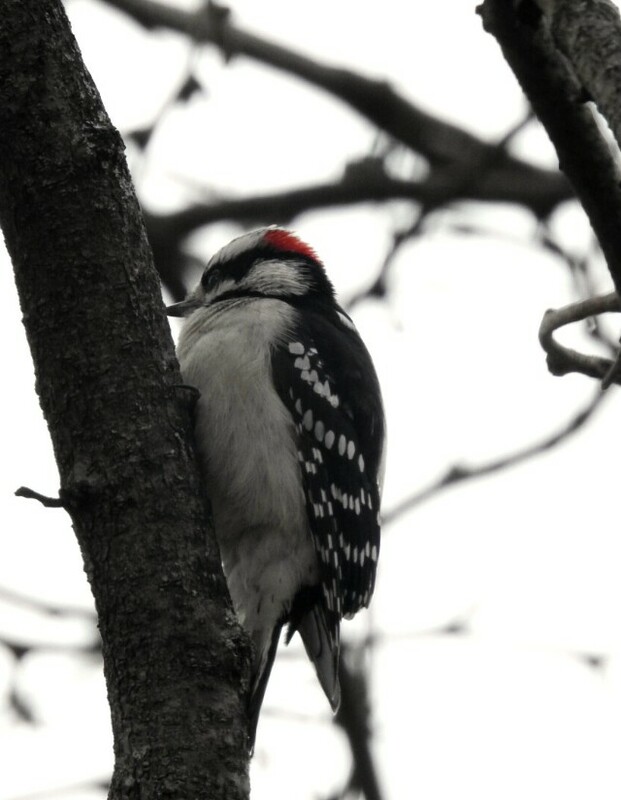 We’ve been seeing a lot of woodpeckers now that the leaves have fallen. A few days ago I counted close to a dozen downy woodpeckers on one of the trees near my house, and red-bellied woodpeckers have been coming around to peck at the locust tree outside my kitchen window. Today I was making lunch when I spotted what looked like a red-breasted nuthatch on the trunk of that selfsame locust tree. I say “looked like” because it flew into the treetops so quickly but I can’t give it a 100% positive ID, only around 80%. The red-breasted nuthatch is one of the few small birds we see around here with that distinctive black striping on its head. I almost thought it was an upside-down chickadee when I first saw it, until my eyes focused on those stripes. I had something on the stove, so I turned it down to a simmer, grabbed my binoculars and camera, and went outside looking for tiny birds hopping around in the treetops. I did indeed see a lot of hopping, but not by anything as small as a red-breasted nuthatch. I did see its cousin, the white-breasted nuthatch, and several hairy woodpeckers, including this one. Oh, and by the time I came back in, the food was a little burned, but it was still edible. I have no regrets. I’m not sure why hairy woodpeckers are called “hairy.” I guess you could say it’s because the feathers on their bellies are fine and hair-like, but so are the feathers on the bellies of many other woodpeckers. The red mark on the back of this one’s head indicates that it is male. The females are completely black and white. Over the coming weeks, I’m hoping to share more of the bird pictures I’ve taken during the fall migration. I haven’t posted much lately because I threw out my back in late September and had to minimize my computer time. But that meant more time for birding, so there are lots of pictures to go through!